4-24-13: Many of our discounted lamps and shades have been sold. So we carefully scouted our showroom and we identified nearly 100 items that we have simply had too long including table and floor lamps, chandeliers, Tiffany, wall and antique lamps and occasional tables of all kinds and sizes. Many are reduced 40-50% and some more. There is as usual no back stock and no reorders. 3-21-13: New introductions from the lamp maker Hoyle Fine Lamps: Small candlestick lamps, Cast metal candlestick lamps with finest heirloom quality rawhide shades. These are limited editions and we are selling them at discount wholesale prices. 2-8-13: Gifts and lower priced accessories have been added to our showroom: Clocks under $19, Rustic Signs under $14, Small Mini Tiffany lamps $34 each and many other items near cost. In lieu of very expensive advertising, we have introduced a new program for our walk in showroom customers: Special purchases of gifts and home decor accessories that customers can purchase for most any occasion: Birthdays, weddings, newborns, Valentines, Christmas, graduation or just because... All of these items are sold near cost and in some cases under cost. Many items are colorful, whimsical, cute and fun. 12-3-12: Tiffany gallery is now completely restocked to maximum capacity from a special discount purchase: Table, floor and chandelier Tiffanies are available at special sale prices - limited quantity - 1 of each is available - no back stock. 10-30-12: Our first newsletter was emailed over this past weekend. If you wish to be added to our mailing list please send us an email. 10-6-12: Our new website is being launched today making it faster and easier than ever to find lampshades and unique custom lighting. 9-10-12: Lamp Repair Special: Free line switch with your repair order for a new gold cord - $10 value. 5-24-12: Visit our lamp shade store as we are heavily discounting all home decor not directly related to lamps and shades. 12-5-11: Wrought iron lighting sale 50% off is still going on. We still have a good selection but only 1 of each is available. Don't let this lighting sale get away as these are the very finest heirloom quality bronze lamps and bronze chandeliers that you will find. 12-4-11: Lamp & Lighting Sale: Throughout our website, lamp and lighting prices have been drastically discounted - only 1 of each is available. 11-26-11: Sale Wrought Iron Lamps, Chandeliers, Lighting, Wall Art, Pictures, Mirrors, Room Screens, End Tables, Occasional Tables, Stands... These home decor items are not on our website (except Wrought Iron Lighting) so bring your truck, SUV or van and visit our showroom for these great deals. 11-25-11: Black Friday Lamp and Shade Sale: Buy 1 - Get 1 FREE - NOTHING EXCLUDED - 1 DAY ONLY - Ends 6PM today. 11-3-11: Chandelier Lamp Shade Sale: Buy 3(or more) Get 3(or more) Free. Unique chandelier shade shapes, interesting fabrics and many contemporary modern styles and colors, drum, cube, bell, square... ends soon. 10-16-11: We now repair, replace and restore decorative metal borders and overlay on slag lamp shades. 10-11-11: METAL FILAGREE and METAL FRAME REPAIR - REPLACEMENT - RESTORATION on antique slag lamp shades. Many customer have slag lamp shades with missing framework and missing decorative overlay filigree. We now offer restoration repair services that completely restore and rebuild these elegant designs. 9-28-11 During this year we have doubled our lamp shade display space and inventory. We now offer one of the largest lamp shade selections on the east coast - right here in little Lincolnton North Carolina. 8-21-11 We have purchased a large selection of antique floor lamps over the summer, just waiting for restoration. 9-5-10: NEW DALE TIFFANY LAMP shipment just in ! 8-8-10: Our lamp repair business has expanded tremendously to include practically any lamp repair, chandelier repair and shade repair imaginable. We do everything from replacing crystal chandelier arms to intricate Tiffany lamp shade repair and silk or parchment paper lamp shade repair and recover as well as antique lamp antique shade repair and restoration. 5-22-10: CLOSING OUT - DISCOUNTS over 100 lamp styles and chandeliers at below wholesale prices, visit our showroom or ask to see photos on our website. 11-26-09: HAPPY THANKSGIVING - We have nearly 1,000 unique lamps and chandeliers in our showroom that you will not see anywhere else. 11-3-09: Our lamp outlet has a much expanded offering of lamp shades, tiffany lamps and antique lamps. 5-25-09: Happy Memorial Day ! Thank You Veterans for our freedoms ! Our website now offers the largest selection of lamp shades, lamp glass and antique lamps on the entire web. 1-21-09: RED TAG EVENT - Over 100 items (lamps, home decor accessories, wall art) are marked way below wholesale to make room for new additions. Save big while they last. 11-30-08: We have substantially expanded our offering of fine antique lamps, especially 6 way floor lamps and hurricane, Gone With The Wind Lamps. Two (2) hurricane lamps in particular are the largest and most colorful ones we have ever seen. 3-13-08: Hundreds of lamps, stands, pictures, mirrors, chandeliers and other home decor items have been marked BELOW PRODUCTION COST. We have had these items too long and THEY MUST BE SOLD. Hurry while selection is best. 2-10-08: Water fountains, pots, planters, bistro sets, bird houses, feeders, buyout arrived today. Patio time is here. 2-6-08:Tiffany lamp warehouse buyout arrived today - one of the largest Tiffany lamp galleries that you will see anywhere. 1-5-08: Special buyout of over 50 chandeliers and sconces that we are selling for about 1/2 of retail: iron chandeliers, brass chandeliers, acrylic chandeliers, porcelain chandeliers, wall sconce light fixtures, hanging pendants and more. 1-3-08:Clearance! - Take 75 % off all hanging glass pendant lamp fixtures ! 1-3-08: Over the last several weeks we have built a wide selection of unique exclusive floor lamps that are available only here. We are proud to offer these "future heirlooms" that we hope will still grace someone's home a hundred years from now. 11-1-07: My son, Seth is making a final visit to our furniture store and lighting showroom dealers with his mobile lamp showroom for 2007. All lamps in the mobile showroom are unique new styles not seen before and not available again. Call 704-732-8001 to set up an appointment to place your last wholesale lamp order of the year.. Call 704-732-8001 to set up an appointment to place your last wholesale lamp order of the year. 10-5-07: Save Clearance going on now. Hundreds of lamps, chandeliers, pendants, occasional furniture and wall decor that we have had too long are incredibly reduced until sold. 10-1-07: A recent special purchase from an art warehouse has been unpacked and is now on display in our showroom. Dozens of large wooden hand painted art panels of birds, flowers, scenes, also blue and white porcelain vases, porcelain trays and lamps are priced around half of retail. I want to acknowledge my son Zach's fine work on our new building. 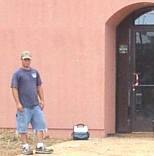 Prior to entering college, he is employed the summer of 2006 by my builder, Houser Masonry. Zach has very many fine quality skills that I had no idea about and of which I am very proud. Our new Lamp & Home Outlet is a tribute to his attitude and his talents. Thanks Zachary ! Your successful attitude will lead you throughout your career. Congratulations on your new career at Motorcycle Mechanics Institute ! Thanks Greg Houser of Houser Masonry for giving Zach an opportunity and for teaching him many new skills. 3-25-06: Rough grading and leveling of the property began today. 4-10: Footings for the foundation are being dug and prepared with rebar steel. 4-13: Concrete foundation was poured today ! 4-21: Cinder block walls are beginning to appear just above the ground level. 4-25: Gravel is delivered for the concrete slab pouring. Rebar is set in the block walls..
4-29: HOKE SIGNS installed a nice temporary sign: "Coming Soon - Lamp & Home Outlet". 5-1: Glass block for exterior walls was selected. 5-10: The plumber started work today on roughing in the water and sewer lines. 5-29: Memorial day - Thank you veterans ! Concrete floor slab poured today (first 1/2). 5-30: 2 months and over 20 different color sample bottles later, stucco color is selected ! 5-31: Concrete floor slab is finished (second 1/2). 6-6: Rear door frames are set. 6-9: The walls are going up. 6-19: The steel roof trusses were set today in preparation for the roofing crew. 6-24: The roof deck foundation is installed. 6-30: The Spanish style facade is being formed. 7-4: Independence day - Thanks troops and veterans for our freedom ! 7-20: Interior stud walls are completed and electrical wiring is in progress. 7-24: Rear door concrete entry pad is poured. 7-25: Air conditioning system is in place and roof drainage pipes are installed. 7-26: Glass block window lights are completed. Window frames are in place. Stucco man provided final color samples of color and texture. 7-27: Meeting with Sign Crafters in Greenville, S.C. to finalize the sign plans. 7-31: Stucco company started work today. 8-24: Exterior stucco is 2/3 complete and interior is ready for painting. 8-30: Interior painting is nearly finished. 9-4: Happy Labor day ! Wall and lighting systems are being installed. 9-11: Floor tile installation begins today. 9-18: Entry walkway pavers started today. 9-19: Plumbing lines and fixture installation is being finalized. 9-25: Parking lot grading should be complete within the next few days. 10-2: Moving in has started. 10-23: Accepting orders and repairs - shipping is around 3 weeks due to our move. 10-27: Final inspection was approved today. We open Monday. October 30, 2006 - WE ARE BACK IN BUSINESS !! !